I adore snail mail art. 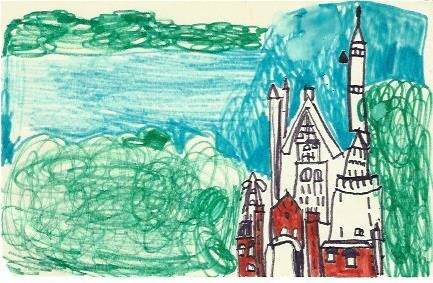 As a kid, I loved to draw. That pastime, along with several others, has remained in my childhood. Over the past few years, however, I’ve noticed that drawn illustrations always catch my eye, more so than photographs, perhaps because we live in such a photographically saturated world. I fell in love with Naomi Bulger‘s work a few years ago, in particular her mail art. 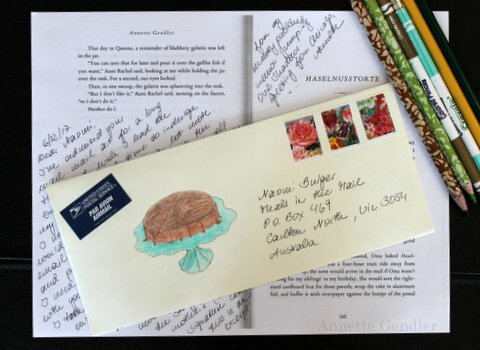 Sadly, letter writing is another pursuit of my younger years that has fallen by the wayside, and so I am fascinated by people who still consistently make the effort that I, only very occasionally, manage to pull off these days, namely to mail something tangible with my handwriting on it. Busy as I am with book publicity, I simply don’t have the brain space and time right now to possibly recultivate an old hobby but, when Naomi’s “Meals in the Mail” project landed in my inbox, I thought, I’ll participate in that, and I’ll be damned if I don’t manage to include a drawing. I decided to send her the recipe of my grandmother’s hazelnut torte that is in the book (that way it fits into all my book publicity work as well). After pilfering my son’s stash of colored pencils, I trained my eyes on a photograph of the cake and voila, as you can see, a drawing does grace the envelope of my mail for Naomi. I do love sending handwritten mail. and I love receiving it. Making my right hand reproduce, via pen and paper, what I see before me, was a thrilling challenge. So, somehow (somehow! ), I must find a way to make space in my life for this fun pursuit. Thank you! Most draw more soon!